For information on adding header elements when faults occur, see the chapter SOAP Fault Handling, earlier in this book. A later chapter discusses WS-Addressing header elements. For information on WS-Security header elements, see Securing Caché Web Services. Informally, each header element is often referred to as a header. This is not strictly accurate, because the message itself can contain at most one header, which is always <Header>, with an appropriate namespace prefix. The header can contain WS-Security header elements, WS-Addressing header elements, and your own custom header elements. Caché represents each header element as an instance of %SOAP.Header or one of its subclasses. %SOAP.Header is an XML-enabled class with properties that correspond to the standard header element attributes (mustUnderstand, actor, and encodingStyle). 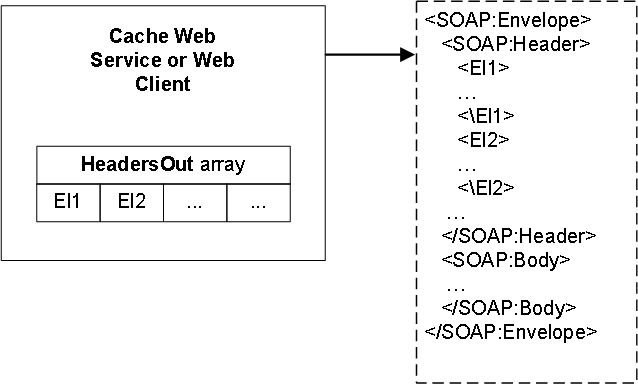 Caché provides specialized subclasses of %SOAP.Header for use with WS-Addressing and WS-Security. To represent custom header elements, you create your own subclasses of %SOAP.Header. When a Caché web service or client receives a SOAP message, it imports and processes the message. During this step, if the message contains a header with custom header elements, Caché compares the header elements to the list of supported header elements (discussed in the next subsection). To use these header elements, your Caché web service or client can access the HeadersIn property. If the SOAP message did not include a <Header> element, the Count() of the HeadersIn property is 0. Similarly, before your Caché web service or client sends a SOAP message, it must update the HeadersOut property so that it contains any custom elements you want to include in the outbound message. If the HeadersOut Count() is 0, the outbound SOAP message does not include a <Header> element. For WS-Addressing, use the AddressingIn and AddressingOut properties rather than the HeadersIn and HeadersOut properties. See the chapter Adding and Using WS-Addressing Header Elements later in this book. For WS-Security header elements, use the WS-Policy features, described in Securing Caché Web Services. Caché SOAP session support uses the HeadersIn and HeadersOut properties. See the chapter SOAP Session Management, later in this book. Caché web services and clients automatically support WS-Addressing and WS-Security headers, but do not automatically support other headers. If you add SOAP headers manually by setting the HeadersOut property, be sure to declare them in an XData block as described in Specifying Supported Header Elements, later in this chapter. Also specify the class parameter USECLASSNAMESPACES as 1 in the web service class. If you add WS-Security headers by setting the SecurityOut property (as described in Securing Caché Web Services), the WSDL does not include all needed information. (This is because the WSDL is generated at compile time and the headers are added later, at runtime.) In this case, save the WSDL to a file and edit it manually as needed. Following the SOAP standard, Caché rejects SOAP messages that contain required but unsupported header elements. Specifically, if Caché web service or client receives a message that contains a header element that includes mustUnderstand=1, and if that service or client does not support that header element, the service or client issues a SOAP fault and then ignores the message. If you use the SOAP Wizard to create a Caché web service or web client based on a given WSDL, the system generates classes to represent any header elements as needed. 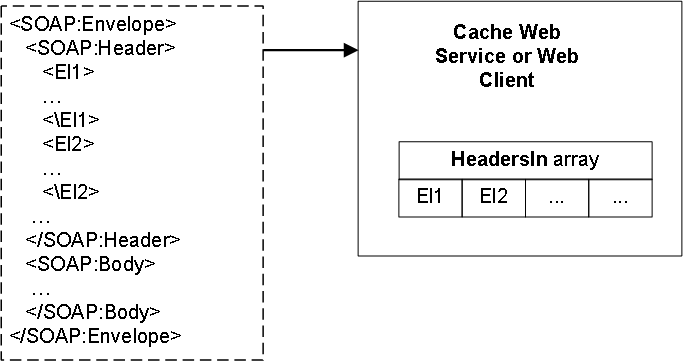 Caché web services and clients automatically support WS-Addressing and WS-Security header elements, but do not automatically support other header elements. class Caché class that represents this header element.